WW3 is breaking out, the nuclear bombs are going off, where would you go? You may not know, but powerful individuals around the world have a plan in case of such event, and it doesn’t include you. In an EOTW scenario, mega-bunkers have been quietly built for the last 60 years, ensuring that world leaders and government structures will continue, no matter what. There are so many underground bunkers we could explore, but we chose to focus on the largest and most significant underground facilities that we know of. Most underground bunkers that become public end up being abandoned, so most if not all of these locations won’t be the primary bunkers for government leaders when the SHTF. But we can at least get an idea of the size, precision and vastness of these subterranean cities and the networks that connect them. Let’s take a look a look at 10 very impressive doomsday bunkers. Mount Weather, also known as the “Mount Weather Emergency Operations Center” is described as a civilian command facility in the heart of Virginia. It is also used as the center of operations for FEMA (Federal Emergency Management Agency). This site is known to be a major relocation site, which would serve as one primary location for the Continuity of Operations Plan. If the President or FEMA were to make an announcement over the Emergency Alert System, it would likely come from here. This location was discovered when TWA Flight 514, crashed into Mount Weath on Dec. 1st 1974. The famed Cheyenne Mountain Complex has been the subject of much curiosity. It is located close to Colorado Springs, Colorado and situated deep in 2000 feet of granite. This facility was designed to withstand a 5 megaton nuclear explosion up to 1.7 miles away. Commissioned at the height of the Cold War, Cheyenne Mountain became one of the nations largest underground facilities and became headquarters for NORAD (North American Aerospace Defense Command) in 1966, as well as U.S. Strategic Command, U.S. Air Force Space Command and U.S. Northern Command (USNORTHCOM) in later years. This facility was at one time critical to to aerospace warning and control during missile or air attacks against North America. While still in use as an alternate command facility, it is likely that since this complex is so well known it will no longer be used in a significant way in the future. Interesting Fact Cheyenne Mountain is commonly seen in fiction, seen in such works as Terminator 3, War Games, Stargate and Jeremiah (tv series). Raven Rock’s construction began in 1950, when President Harry S. Truman approved the construction of this facility. It was meant for use as a relocation site for the pentagon staff (up to 3000 people). Over 1.5 million cubic yards of granite rock were blasted out during the construction period of only 10 months. There were five, 3 story buildings originally built in the complex. The complex has roughly 700,000 square feet of usable space. Located along the Pennsylvania-Maryland border, the Raven Rock Mountain Complex is full is interesting amenities. While it started with very simple facilities it now includes: several underground reservoirs, a high-tech ventilation system, fire department, dental clinic, medical clinic, dining facility, post office, snack bar, dormitories, chapel, barber shop, fitness center and even, you guessed it, a Starbucks. Interesting Fact Raven Rock is shown the video game “Fallout 3″ as being the east-coast headquarters for a fragmented government group know as “the enclave”. It is also the location of a self-aware super computer known as “ZAX”. Near Moscow State University, in the Ramenki district, there is a series of complex underground buildings. These facilities could supposedly hold up to 15,000 people, which is an unheard of amount of people compared to most government bunkers. They could also maintain this system for up to 30 years, which is again very unprecedented. The Underground City is referred to as “Ramenki-43″ by the general public. 43 is thought to be the address of one of the facility entrances. The Greenbrier bunker demonstrates the fact that not all bunkers are located in conspicious locations. Back in 1958 the United States government agreed to build the luxury hotel a brand new addition, in exchange they were also allowed to build a 120,000 square foot bunker beneath it. The Greenbrier in Virginia, a mere 5-6 hour drive from Washington D.C., was a popular vacation destination for Washingtons elite. This location was at one time the destination for members of Congress, the Senate and their respective staff (up to 1100). This would mean that under the Continuity of Government plan, this location would have become the house and the senate. Codenamed “Project Greek Island”, the bunker was filled with survival necessities. It included; 53 rooms, a 7500 square foot kitchen with 2 months of food, 18 dormitories which could sleep 60 people (each with toilets, shower and a small lounge), a 600 square foot medical clinic with 12 beds and an intensive care and operation room and all the radio and communications equipment needed to send messages to “survivors”. This facility was completely secret until Ted Gup of the Washington Post exposed it in 1992. It was immediately decommissioned after this. 100 feet beneath the surface or Corsham, exists a 35 acre cold war city known as the Burlington Bunker. Code named “Burlington”, the British government built this site in 1950 in case of nuclear strike and was intended to be the Emergency Government War Headquarters. The shelter was designed to accommodate 6,000 people for up to 3 months. And with the underground lake and water treatment facility, it is possible that people could live here much longer than that. You will see all the typically bunker equipment here, everything from an underground power station to communications equipment and even the second largest telephone exchange in Britain. The BBC would’ve broadcast emergency messages from this location. The site was decommissioned in 2005. Very little is known about this complex, but what is known is significant. In 2006 The Shanghai Morning Post announced the completion of a million square foot bunker capable of housing up to 200,000 people. This is the largest capacity for a bunker we have ever heard. This shelter was designed to withstand blast, nuclear radiation and poisionous gas emissions. According to Shanghai Morning Post, 15 tunnels, each of which stretches 4,000 meters, link more than 10 trading centers, office buildings, and residential buildings throughout the city. 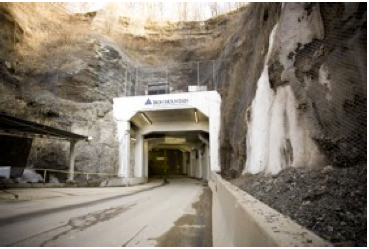 The complex is equipped with its own power supply, ventilation, and power storage capability, which is able to ensure a daily underground supply for 1–2 weeks. The shelter is also well connected to ground-level railway transportation from southern Xingzhuang region to northern Baoshan, providing flexibility to those seeking refuge from disasters. During non-emergencies, portions of the underground bunker could potentially be used as a commercial garage or storehouse. Official news stories don’t give any official explanation as to the purpose of this facility, but it seems fairly clear. With inflation and wage pressures also mounting, a growing number of investors are starting to question the long-term sustainability of China’s investment-heavy growth model. A survey of global investors by Bloomberg last week found that 45pc of them expect a financial crisis in China within the next five years, with another 40pc anticipating a crisis after 2016. Denver International Airport is one of the nations largest and busiest new airports. At over 53 square miles, the Denver International Airport is the largest international airport in the United States and the third in the world. There is a large network of subterranean tunnels here, used for an “automated baggage system”. When the system failed miserably, they spent 1 million dollars per day for several months worth to repair it. Eventually in 2005, the airport abandoned this automated system all together to save 1 million per month of maintenance costs. The airport has extensive alternative energy systems, uncharacteristic of the modern airport. During early phases of construction, 5 buildings were built and then deemed to have been built improperly. These buildings weren’t torn down but instead new buildings were built over them. Is there something there, you decide. The Svalbard Global Seed Vault is located in the remote arctic of Norway, only 810 miles away from the North Pole. Created through a joint effort, the seed vault is designed to be a sort of Noah’s Ark for humanity. This facility stores seeds from as many varieties of plants as possible, in case they were all wiped out during a major catastrophe. The original cooperative between the Norwegian government, the the Nordic Genetic Resource Center and Global Crop Diversity Trust (GCDT) gained the initial push needed to build the vault. Additional funding to the tune of 9 million was received from The Bill and Melinda Gates foundation, Brazil, Australia, Norway, United Kingdom, Sweden, India, Columbia and even Ethiopia for construction. Didn’t get enough about bunkers? Do you Need to Stock Up the Bunker?